When it comes to inheritance tax planning, you might think there is little you can do to minimise the amount your estate ends up paying. After all, inheritance tax (or IHT) is often in the news, labelled as the unfair tax, which sees HMRC effectively taking tax on money which has, during the course of your lifetime, been subject to taxes already. A double tax, if you like. So you’ll be pleased to know there are measures you can take, but first let’s look at how your inheritance is taxed. the value of your estate is below the £325,000 threshold. If you’re married or in a civil partnership and your estate is worth less than £325,000, any unused threshold can be added to your partner’s threshold when you die. This means the threshold can be as much as £650,000. Before the value of property increased, this threshold seemed quite high. But according to the Office for National Statistics, average house prices in the UK increased by 6.7% in the year to November 2016 continuing the strong growth seen since the end of 2013. The latest figure for the average house price is £217,928 – so in many more cases than before, the value of people’s homes means the estate is liable for IHT. Estates valued at higher than the threshold pay tax at 40%. Not only that, the money is handed over before the remainder is distributed to the beneficiaries. 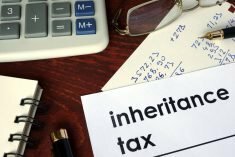 In fact, the government raised £4.7billion in inheritance tax in the year to April 2016 – up 22 per cent on the year before and the highest take ever. From April 2017, the government is introducing a new home allowance, or residence nil rate band (RNRB), which will help take some estates out of IHT liability. But the rules are complicated, and many estates will still incur inheritance tax. IHT planning, like any planning, needs to be done ahead of time. You may not like to think about dying – who does? – but the sooner you put plans in place, the better. You never know what is around the corner. The two main vehicles used in inheritance tax planning are gifts and trusts. You can give away £3,000 worth of gifts each tax year (6 April to 5 April) without them being added to the value of your estate. This is known as your ‘annual exemption’. And you can carry any unused annual exemption forward to the next year – but only for one year. If you die and your estate needs to pay IHT, it’s charged at 40% on gifts given in the three years preceding your death. Gifts made three to seven years before your death are taxed on a sliding scale known as ‘taper relief’. So, in a nutshell, if you make gifts then the longer you live after doing so, the less likely you are to pay inheritance tax. You can link your estate to trusts, so that funds are transferred out of your estate whilst you are still alive – you can get the interest and income produced, but the capital element is outside your estate, as it is owned by a trust. You might want to consider taking out life assurance policies, whose purpose is to cover the inheritance tax bill, so freeing up your estate to go to your beneficiaries. Such policies are set up as trusts. The key for reducing inheritance tax is to plan ahead, so you minimise your inheritance tax bill and maximise the amount you can pass on to your loved ones. If you would help or advice about inheritance tax planning, please get in touch with the team at Hartsfield.